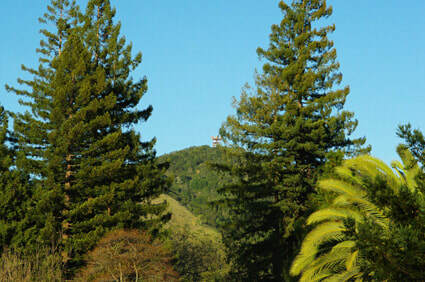 San Rafael has many unique and great neighborhoods. The Federation's Steering Committee is comprised of leaders from a variety of neighborhoods. Here's a brief introduction and links to their respective websites and contacts. 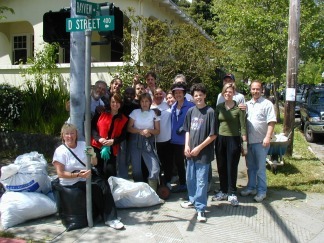 The Bret Harte Community Association, in existence for over 50 years, is a neighborhood organization that supports approximately 500 residences, with the purpose of bringing the community together. The BHCA is funded by neighborhood and community donations. A $10/year per household donation is suggested, however, all activities are available to all neighborhood residents regardless of donor status. The many accomplishments of BHCA are achieved solely through volunteer efforts. Embraced by the ridges of China Camp State Park, the Glenwood Neighborhood is nestled on the shore of San Pablo Bay where it receives the first rays of the new day. The marine climate is influenced by San Francisco Bay, so there is a 3-5 degree difference between downtown. Residents have easy access to hiking trails, enjoy wildlife and migrating waterbirds, while windsurfers and recreational fishermen utilize our shoreline. Our neighborhood boasts of Glenwood Elementary School, a National Blue Ribbon and California Distinguished School; Church of the Redeemer; and Victor Jones Park. A new, exciting renovation plan for Victor Jones Park is currently underway in collaboration with the city of San Rafael. The Glenwood Homeowners' Association, a voluntary board of Glenwood residents, has established a website, www.glenwood94901.org , as the main vehicle for communications. It offers neighborhood news, emergency preparedness information, youth job opportunities, advertising space for Glenwood-based businesses, games and more. We also provide welcome baskets for new neighbors, and organize a number of events during the year, including our renowned Easter Egg Hunt. 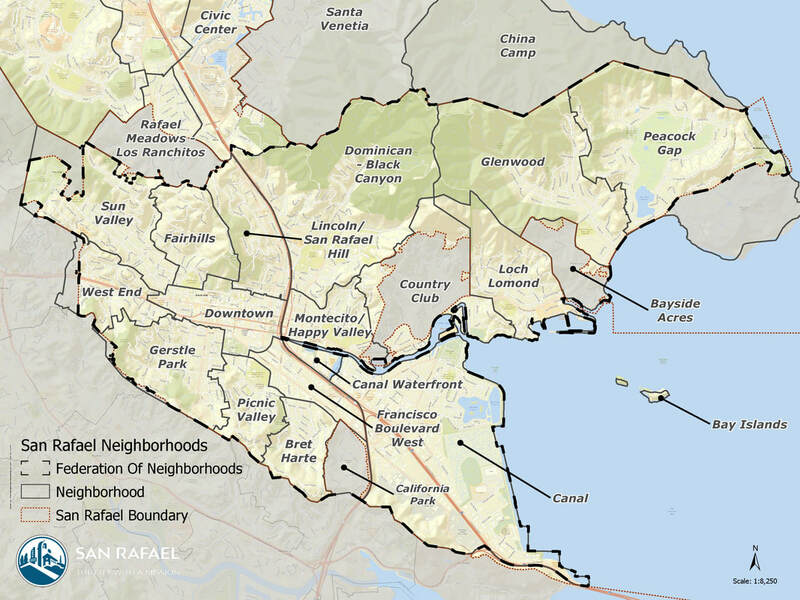 The LSRHNA is the area North of Mission Street, west of Highway 101, South of Fair Drive, and East of the San Rafael Hill. Our Mission is to build a sense of community within our neighborhood. We provide a forum to voice concerns, review information, current events, and resolve local issues, affecting our community. We represent your concerns for the community and present them to the city and county government to affect change. The Montecito Area (Happy Valley) is one of San Rafael's oldest neighborhoods, with elegant historic homes and a diversity of business, community, and school activity. At the MARA home page you'll find links to archived newsletters and articles that feature some of our city's more interesting and lesser-known history, from decades past to recent times. The Park-Jewell Triangle beautification project is one example of a community beautification project sponsored by MARA. Peacock Gap is a quiet neighborhood of mid-century modern and ranch style homes surrounding the Peacock Gap Golf Course. Developed in the mid-50’s and early 60’s with larger estate homes added in the 70’s and 80’s, it characterizes the best in suburban living. Homes nestle on the golf course, surround a green lagoon with natural islands or cantilever over granite hillsides with magnificent views of San Francisco Bay and Mt Tam. 2000 acres of state park border the Peacock Gap neighborhood on the north, and the Bay curves around this delightful haven on three sides. The weather is warm and temperate, and Peacock Gap residents enjoy outdoor living on spacious patios and decks most of the year. The golf course is undergoing a complete renovation to modernize both the course and its public buildings, which will include a day spa and other amenities. The Peacock Gap Homeowners Association is a vibrant and progressive organization of community-minded individuals who take pride in their neighborhood. Visit us at www.peacockgaphoa.org.